Whoa. Mashable. Hold it there. Be careful with this report. 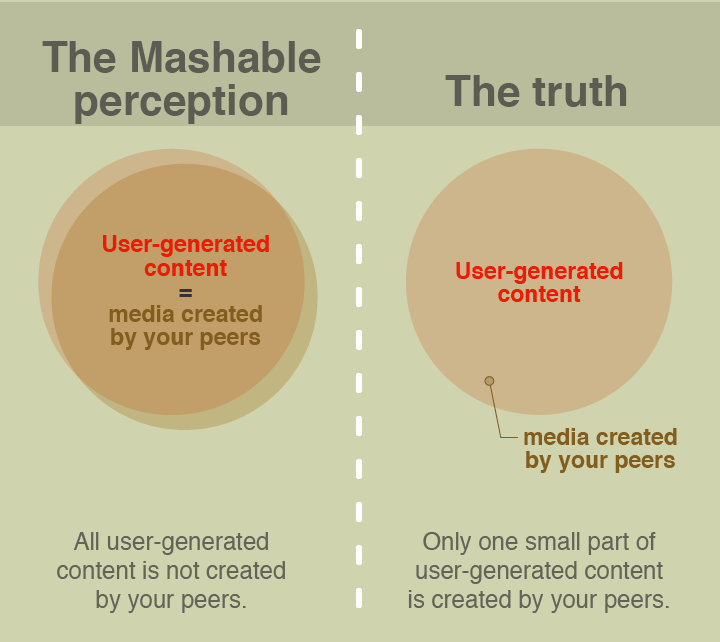 Mashable is blending together the terms “user-generated content” with content made by your peers. User-generated content is created by people you know AND by people you don’t know. Millennials trust content made by people they know–not ALL user-generated content by people they don’t know. We can’t go around making blanket statements that ALL user-generated content is more trusted. If someone you don’t know posts a photo and claims something about that photo, will you trust that person? Perhaps not. But if someone you know posts a photo and makes a claim about that photo, depending on the person, you might trust him/her–because you know that person. With Mashable bending the truth to make a eye-catching headline, it’s no wonder that Millennials don’t trust brands as much.